1. Marinate chicken in lemon juice, garlic paste, and salt mixture for 1 hour. 2. Mix paneer, cream, corn flour, green chilli paste, white pepper powder and green coriander in a bowl. 4. Marinate chicken in this mixture for at least 3 hours. 5. Skewer chicken 2 cm apart and roast in a preheated oven (180C/350F), oven/ tandoor/ grill for 8-10 minutes. 6. Baste with butter and roast for another 3 minutes or until golden in colour. 7. Garnish with tomato, onion and cucumber slices. 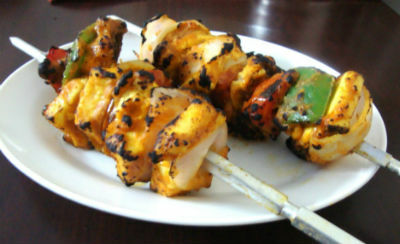 Feel free to comment or share your thoughts on this Murgh Paneer Tikka Recipe from Awesome Cuisine.